Much like cupcakes, hamburgers are a trendy food these days. From behemoths like Five Guys to smaller shops like Bobby's Burger Palace and 500 Degrees, more restaurants are dedicating themselves to the humble patty. 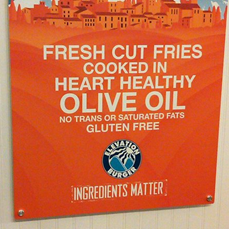 Virginia-based Elevation Burger takes this mission seriously. The chain, which has area locations in Collegeville (201 Plaza Drive, 610-831-1360), Wynnewood (50 E. Wynnewood Road, 610-645-7704) and Moorestown (400 Route 38, 888-291-4620), serves up 100% organic, grass-fed and free-range beef along with fresh-cut fries cooked in trans-fat-free olive oil. The just-opened Moorestown spot - overlooking the parking lot outside the mall's food court - has a spartan look, with white walls adorned with cute posters touting the menu's virtues. After customers place their orders at the counter, they can grab a seat while waiting for a runner to serve the meals in less than 10 minutes. Gluten-free diners can get their burgers naked (in our case, we brought a bun from home) or wrapped in lettuce. 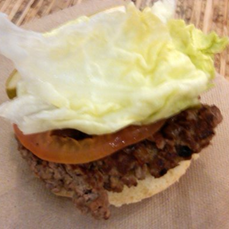 My son ordered his burger ($3.59) with lettuce, tomato, pickles, caramelized onions and "Elevation Sauce," which tasted like Russian dressing. The burgers are cooked on a grill away from the buns, although I did ask the employee who was topping them to change his gloves to avoid cross-contamination. The burgers were moist and flavorful without being overly greasy. (I'm talking to you, Five Guys.) 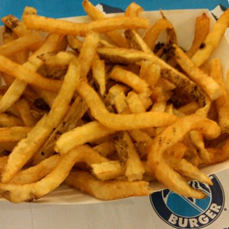 With some of the skin still remaining, the shoestring-style fries ($2.59), while not as crispy as those from thicker-sliced spuds, were nonetheless addicting. Customers can upgrade to a cheeseburger, made with non-processed cheddar, for 40 cents more or super-size to a double cheeseburger for $5.99. For the more adventurous, the Vertigo Burger starts at $5.99 for three patties; each additional patty (up to - gulp - 10!) costs $1.99. Other gluten-free items include the Elevation Salad with romaine, pecans and mandarin oranges ($5.99), side salad ($2.49) and a mandarin orange cup ($1.59). The Blue Bunny ice cream used for the shakes is gluten-free, although the restaurant also makes malts and uses Oreo cookies for mix-ins, so we avoided them.